The skies were clear today, and there was large sunspot group that I wanted to try and capture before they rotated out of view. The temperature was very comfortable too. The sky conditions for imaging were average. One would never know it that our star is in solar minimum right now. The surface is quite active. Active regions AR2674 and AR2673 are the most predominant objects on the disk. 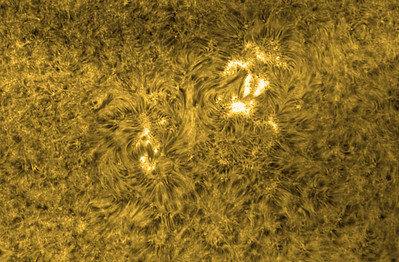 Smaller active regions AR2677 and AR2677 can be seen toward the middle of the disk. 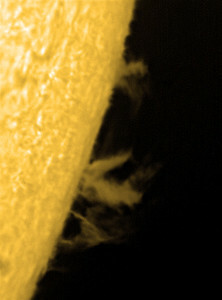 Prominence activity was minimal, but I did manage to capture a small active prom area on the south-western limb. No other prom activity was detected. 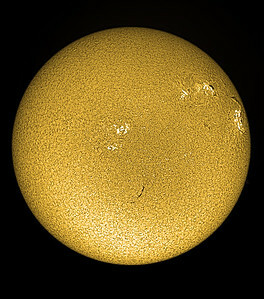 Used my Lunt LS100THa Solar scope with the double stacking module installed, on an Atlas EQ-G mount. 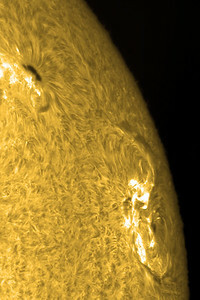 Guiding was done using a Hinode Solar Guider. Capturing camera was a ZWO ASI174mm. Post processing accomplished using AutoStakkert II, Registax 6(wavelets), and Photoshop CS6. False color added.